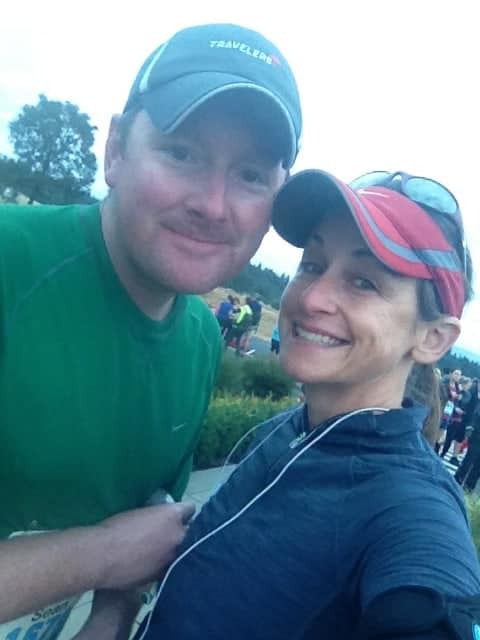 Last month, hubby and I decided spend a rare “date day” running a half marathon. Some couples choose to go to a movie and dinner when they get away from the kids; we chose to run 13.1 miles together. I guess you could call us weird. 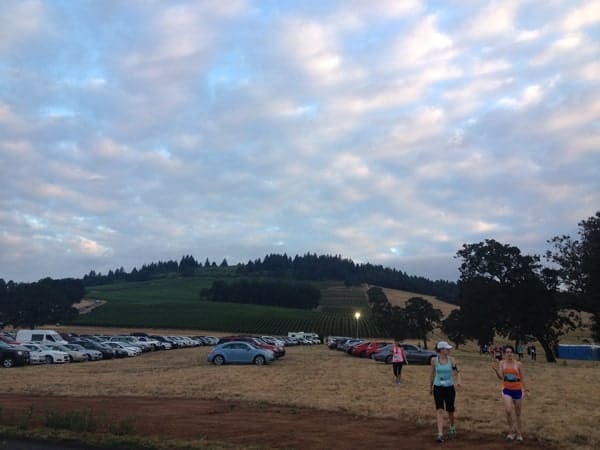 The race was the Oregon Wine Country Half Marathon. 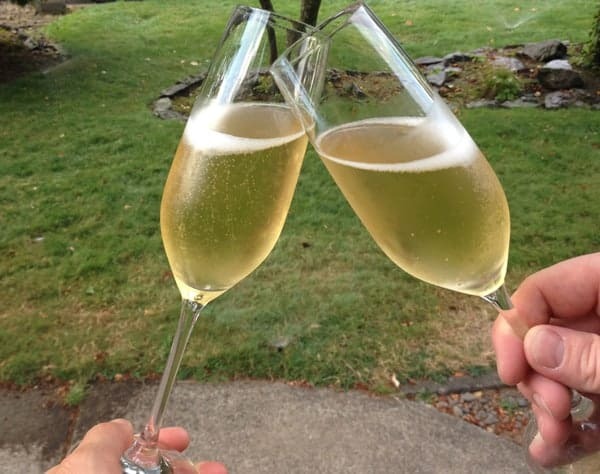 You may remember that I participated in the same race last year, and even wrote about it here on the blog as well as in Oregon Wine Press. After such an incredible experience last year I couldn’t wait to do it again. Only this time I wanted to recruit the hubs to join. Only time got ahead of us this summer and we suddenly found ourselves in mid-August, without having adequately prepared for the race. Though we had registered for the full 13.1-mile half-marathon we nearly panicked two weeks before the race, fearing our bodies weren’t ready for that amount of mileage and such little preparation. I’ll just admit it, we were way too out of shape and way too chicken s##t to try. Around that same time, the PR firm representing the race reached out to me to see if I wanted to be a media guest, offering complimentary entry fee. Though we had already paid for our entries I agreed to be a guest, and also asked if we could change our registration to the two-person relay instead of the half. It seemed more doable to run six or seven miles, instead of thirteen. We woke up dark and early at 4:30 am on that brisk and clear morning, and drove out to Carlton to get to the race on time for the 7:00 am start time. I was paranoid about getting there in time in order to park in Carlton (where the race ends), take the shuttle to Stoller Vineyards (where the race begins), get our registration packets, and then catch another shuttle to the relay halfway point (I would be running the second half). But to my amazement and surprise everything was so well organized, and there were several shuttles waiting for those who needed rides to and from the start and finish line. The line to pick up our packets was quick and efficient, leaving us some time to watch the sun rising from atop the stunning vineyards at Stoller. It was then time to go our separate ways. Hubs left for the start line, and I hitched a ride in another shuttle to get to the relay halfway point. Well as Mary said, we were in no shape to complete the full. But what made this such a cool race was the option to do the relay (and let’s be honest, the finish has wine tasting). 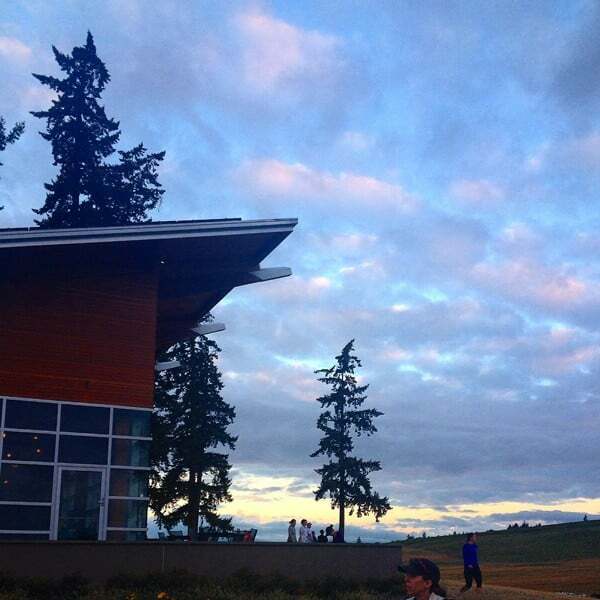 Starting from the hilltop at Stoller Vineyards, we watched as the sun came up on a perfect brisk morning. The kind of weather you hope for when about to run a long distance. With hundreds of runners surrounding me, it was a busy start, but we all made it out with no hiccups and began the first 6 miles of the relay. The course was fantastic, hilly right from the start, but I was running through vineyard hills, and the quiet home lined streets of Carlton, making it worth the extra effort. It was open with a couple of water stops and you couldn’t beat the views. Maybe the views seemed better because I am a slow runner, maybe, but as I approached the relay you could really see the valley open up at mile 6. That is, after you climbed a very long and steep hill. I had been waiting about a half an hour by the time hubs finally came running round the bend. After giving him a quick high five I took off. Perhaps it was the adrenaline that had built up while waiting for him and watching dozens and dozens of runners racing by, but I took off at a full on sprint. I kept telling myself, “Woah Mary, slow it down, you don’t want to bonk out midway through.” But I just kept going. Maybe it was the feeling of passing up people that boosted my confidence; or maybe it was the loud Britney Spears music rocking from my iPod? 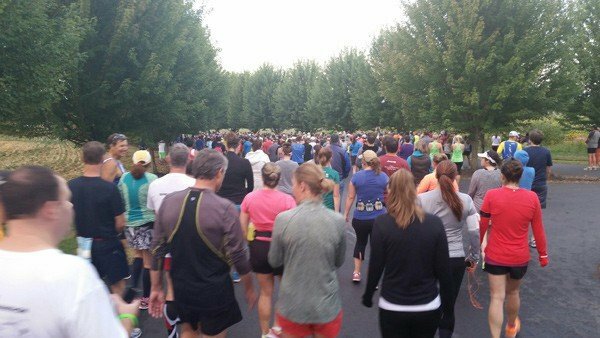 Later I had to remind my prideful ego that most of those people had already run six miles before I started. I had the advantage. I even managed to stop at the mile 8 wine tasting stop (yes, they serve wine on the route), take a wine sipping selfie (you would too! ), sip some Pinot Gris, and still continue at a 7 minute mile. It wasn’t until three miles into my relay that my pace began to slow to a more reasonable pace. There was just something about that gorgeous route and the fresh morning air that kept me motivated to run so quickly. Before I knew it the race was over. I did my 7 miles in 60 minutes and 6 seconds! Not too shabby! Hubs was waiting for me the moment I crossed the finish line in downtown Carlton, and after a couple coconut waters to rehydrate we were ready for some wine! 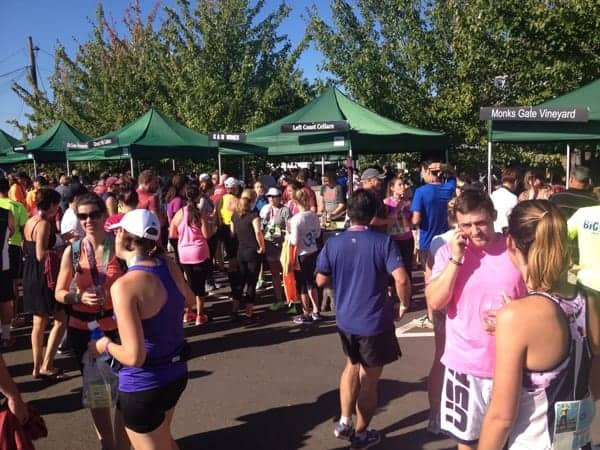 The wine festival following the race is reason alone to register for this event. It’s an awesome way to end a long run. 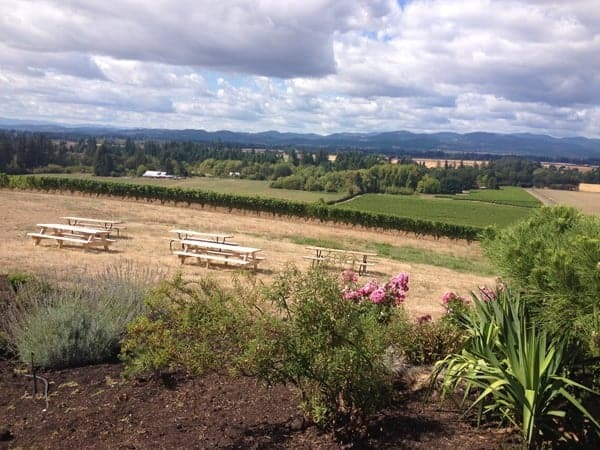 There were around 20 wineries (including some of my favorites, like Stoller, Adelsheim, K&M, Elk Cove, Seven of Hearts, Stag Hollow, and so many more), each to them pouring 2-3 wines. The benefit of finishing fairly early was that the lines were short. A couple hours after the wine festival began the lines grew deeper and deeper. My only wish was that the wineries offered more white and rosé wines, and less reds. I mean, seriously, it was a hot morning and the majority of the people tasting wines just got done running a half marathon in the heat. Give the people something refreshing (like the ever-so-tasty Pinot Noir rosé offered from Seven of Hearts, yum). Food for thought for the 2015 race. … Soaking up the last few moments before heading back to the kids. And then home to toast to a fantastic morning. Heck yeah, and so will my husband. And I promise to be better prepared for the full 13.1 miles!